First US delivered car was to Darryl Allison from J-Spec Connect. Great to see the happy new owner. 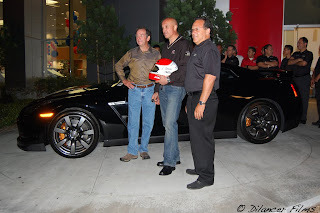 LOS ANGELES, July 7 /PRNewswire-FirstCall/ -- Nissan North America, Inc. (Nasdaq: NSANY) saved a few fireworks for the morning after the Independence Day holiday, delivering the first Nissan GT-R supercar in the United States at 12:01 a.m. PDT today to a Southern California customer. The exotic, all-new 2009 Nissan GT-R, long coveted by American buyers who previously could experience the legendary GT-R only through electronic video games, officially goes on sale today at a select number of GT-R Certified Nissan dealers across the country. Daryl Alison of Costa Mesa, Calif., one of the first customers to order a new GT-R through a pre-sale program launched last January, couldn’t wait for normal business hours to take possession of his new Black Obsidian GT-R Premium model. Through special arrangement with Universal City Nissan, Los Angeles, Alison was handed the keys by dealer representative Mike Sage moments after midnight. "I’ve followed the history of the GT-R since inception and, after years of anticipation, it’s great to see the ’Godzilla of supercars’ finally coming to the U.S.," said Alison. "I’ve owned a number of Nissan 350Z sports cars and other exotics and muscle cars, but more than any other vehicle I can’t wait to get this new GT-R out on the road. Now it’s America’s time to get in and play." More than 1,700 of the exotic 480-horsepower Nissan GT-R supercars, or approximately 70 percent of the first year allocation for the United States market, have already been spoken for, with deliveries of those initial orders expected to continue throughout the coming months. "It’s a very exciting time for Nissan and auto enthusiasts who have waited a long time for the GT-R to become available in the U.S.," said Sage. "Demand for the GT-R has been overwhelming, with more people wanting them than cars available. We’re pleased to deliver the very first GT-R to an enthusiast who will really appreciate its extraordinary performance abilities." Joining the midnight delivery ceremony was Steve Millen, long-time Nissan race driver and the winningest driver in IMSA GT race series history. Millen recently participated in high-performance racetrack test sessions in the Nissan GT-R for a leading automotive enthusiast magazine and has assisted with GT-R dealer orientation and training programs. The GT-R is available only through officially certified Nissan dealers that have met a number of strict sales, service and facilities commitments, including dedicating a master technician to GT-R service. A searchable listing of the GT-R Certified Nissan dealers is available to consumers on nissanusa.com. The 2009 Nissan GT-R has a Manufacturer’s Suggested Retail Price (MSRP)* of $69,850 for the GT-R and $71,900 for the GT-R Premium model. The 2009 Nissan GT-R features a 3.8-liter twin turbo V6 producing 480 horsepower and 430 lb-ft of torque, backed by an all-new, paddle-shifted, dual clutch sequential 6-speed rear transaxle. It features the use of a world’s first independent rear transaxle ATTESA E-TS all-wheel drive system, which places the transmission, transfer case and final drive at the rear of the vehicle, optimizing weight distribution and maximizing handling capability. The Nissan GT-R’s hybrid body construction combines steel, carbon fiber and die-cast aluminum and has a low coefficient of drag of 0.27, while achieving high front and rear downforce. GT-R’s four-passenger cabin features a sloping "aero blade canopy" roofline and curved C-pillar "sword edge," as well as GT-R’s hallmark four-ring taillights, functional rear carbon fiber underbody diffuser, rear spoiler and large, integrated quad exhaust tips. Inside, GT-R’s interior includes sculpted performance bucket seats for an optimal driving position, a cockpit-style instrument panel with a large center-mounted tachometer and a multi-function display - which includes mechanical and driving information, as well as an on-board driving recorder. A 2009 Nissan GT-R recently set a lap time of 7 minutes 29 seconds at the famed Nurburgring Nordschleife, one of the fastest times achieved by a production-spec vehicle to date, and has been timed in independent magazine tests at 0 - 60 miles per hour in under 3.5 seconds. Let the happy owners begin.